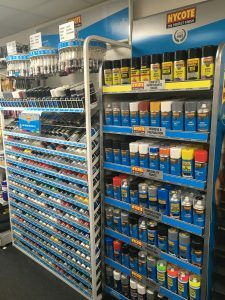 A comprehensive range of acrylic aerosol paints. Suitable for almost every car manufacturer and available in a wide range of colours Hycote Aerosol Spray Paints are durable and long lasting. In addition to paint materials The Parts Store supply all the necessary ancillary products required for surface preparation to ensure a quality finish. These include a range of coated abrasives, sealers, adhesives, cutting compounds, polishes and a range of hygiene products including protective gloves and safety masks.